Miriam Yalan-Stekelis (1900-1983) was born in Kremenchug, Russia, the daughter of a Zionist leader who came from a long line of rabbis. Thus she learned Hebrew as a small child. After the failed 1905 revolution, the family traveled from one place to another: Berlin, Minsk, Petrograd, and Kharkhov. Yalan-Stekelis studied humanities at the University of Kharkhov, continued at the College of Judaic Studies in Berlin, and then studied library science in Paris in 1928. In 1920 she settled in Jerusalem and in 1929, after her studies in France, she joined the National University Library. She spent the next 30 years as director of the Slavic department. 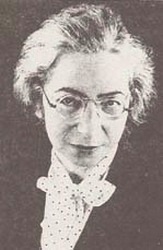 Yalan-Stekelis established herself as a children's writer in 1939. She wrote poetry, fiction and songs, edited, and translated from Russian, Yiddish and English to Hebrew. She received the 1956 Israel Prize for Children's Literature.